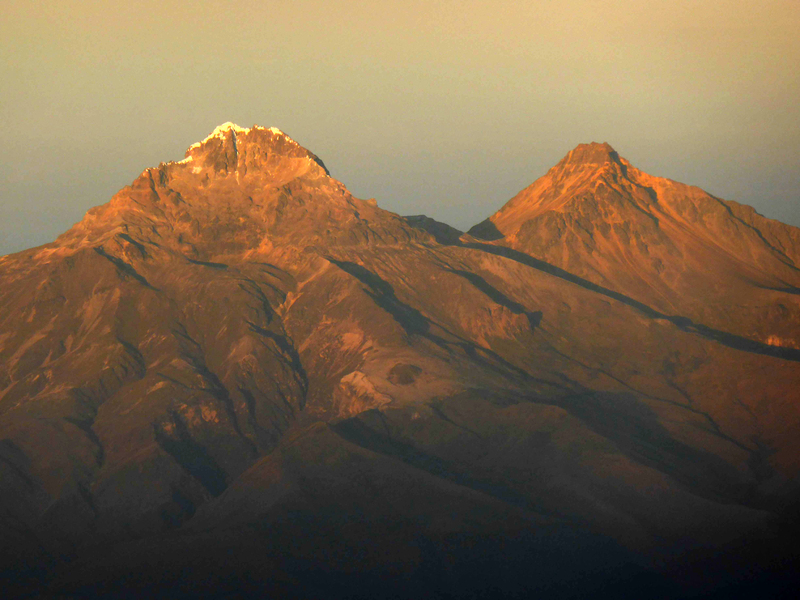 5263m Illiniza Sur is Ecuador’s 6th highest peak, and considered one of its more technically challenging. 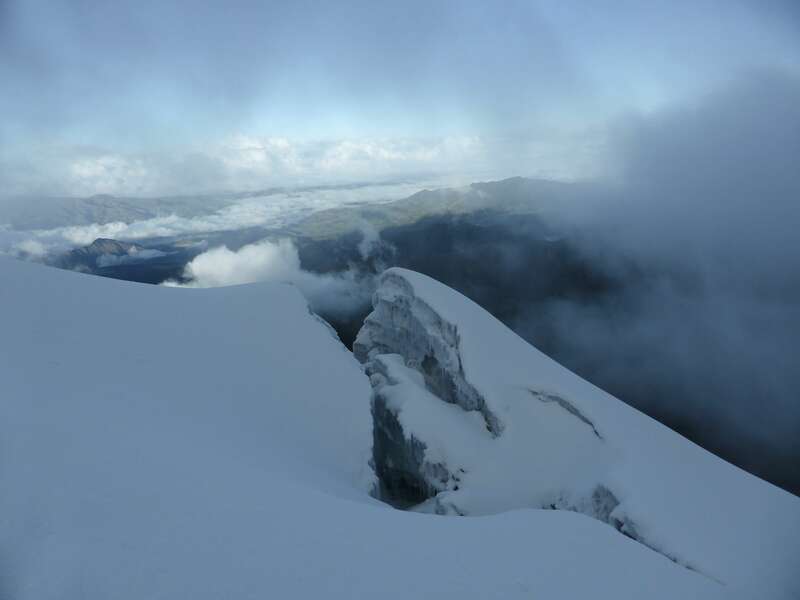 Illiniza Sur is so named as the southern of the two Illinizas, a pair of volcanic mountains located in the Reserva ecologica Los Ilinizas national park south-west of Quito near the city of Machachi. Unlike its northern counterpart Illiniza Norte which can be climbed via a ridge scramble, Illiniza Sur is glaciated and a technical, if relatively straightforward, climb. 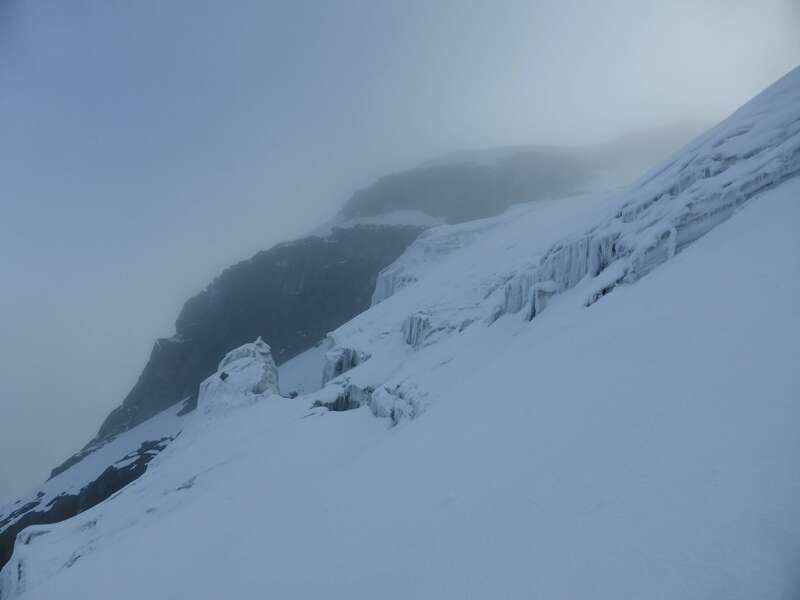 For its steep and direct route Illiniza Sur was one of my two main climbing goals in Ecuador, the other being 6310m Chimborazo. 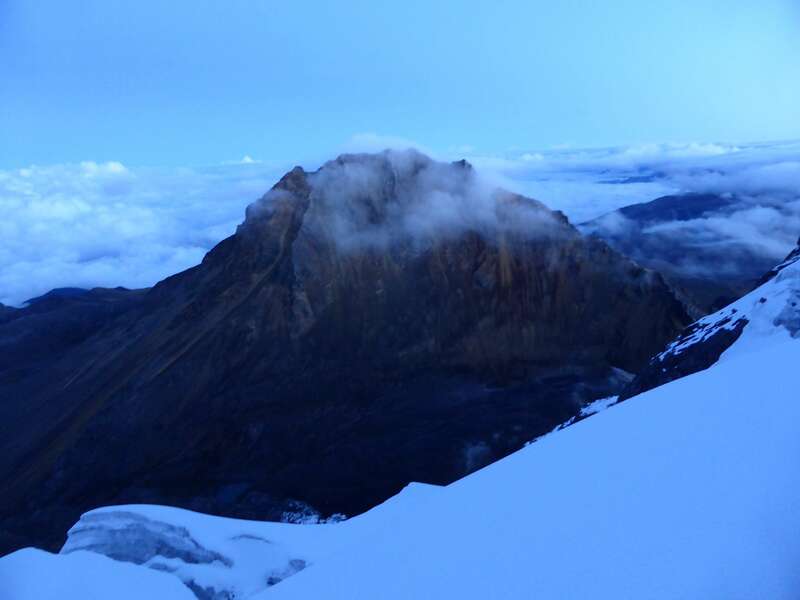 I climbed Illiniza Sur on my 5th day in Ecuador after spending several days acclimatizing. I had hiked 4791m Corazon two days prior, climbed 5126m Illiniza Norte the day before, and had spent two nights sleeping in the Illiniza mountain refuge at ~4700m before my climb. I was fairly well acclimatized by the start of the climb, but having arrived in Ecuador from near sea level was still feeling the weight of altitude. My acclimatization and climbing itinerary can be seen here. My climb began from the Illiniza refuge, a mountain hut located at 4700m near the saddle between Illiniza Norte and Illiniza Sur. The refuge is reached via a straightforward and moderately sloped hike, and its presence makes accessing the Illinizas incredibly convenient. The hut is managed by a permanent guardian who watches climber’s gear, provides hot water, and prepares hot food for a moderate fee. Staying in the hut for three days and two nights cost my guide and I around $70 USD, including food. 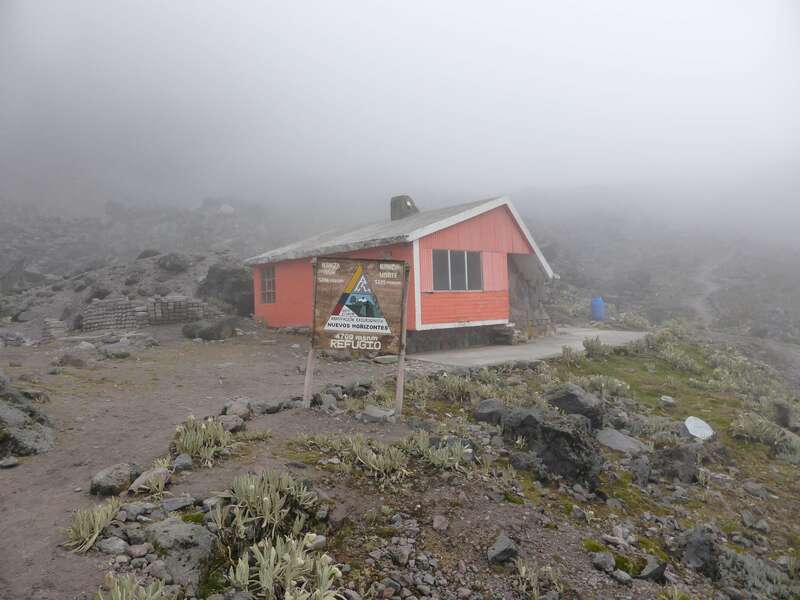 The hut’s altitude and accessibility contribute to the popularity of the Illinizas as preparatory acclimatization climbs for Ecuador’s higher mountains. My Ecuadorian climbing partner and mountain guide Pato and I left the hut and began hiking across the saddle at 4:00 a.m, each carrying two snow pickets and a pair of ice axes in addition to our light summit packs. We were the only two climbers on the Illinizas this day. The weather was wet and cold, lightly raining and windy. 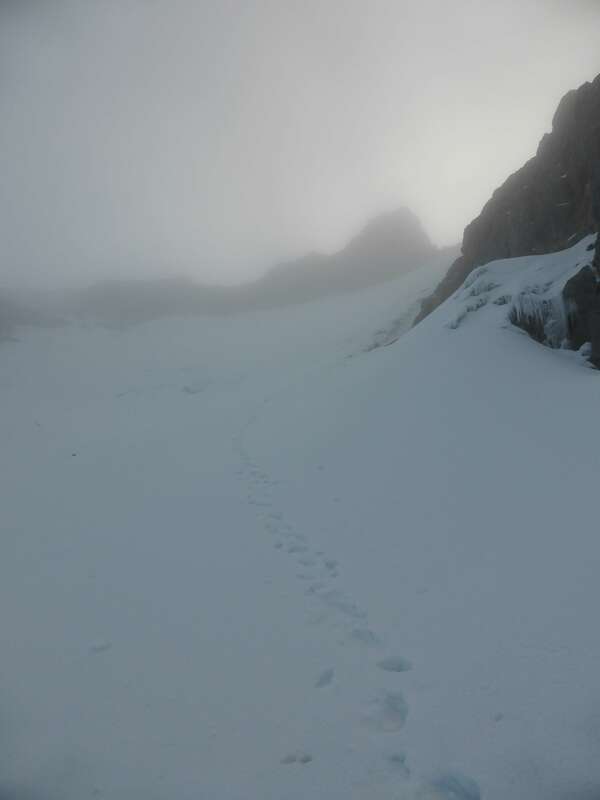 Roughly 40 minutes after leaving the cabin, we reached the base of the steep rock gulley used to access the glacier and the normal climbing route. The hike to the gully was cairned, and relatively worn from use, but high humidity made visibility low. The gully itself was steep, iced over in areas, and slippery wet from the humidity. 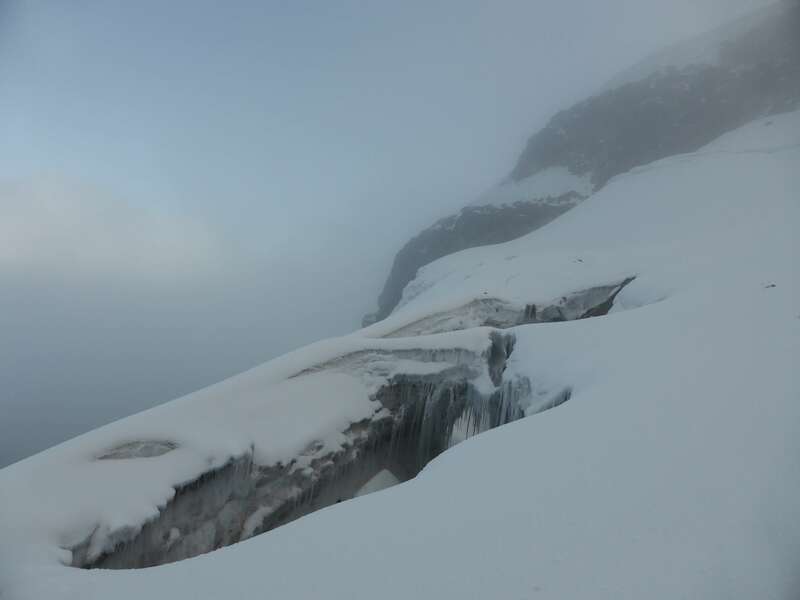 The hike to the bottom of the gully and the gully itself represent the only real route finding on Illiniza Sur’s normal route, as the remaining climbing directly follows the line of the glacier. As we reached the top of the gully the rain stopped, and the clouds slowly began to thin. Past the gully we gained the glacier and the route upwards. 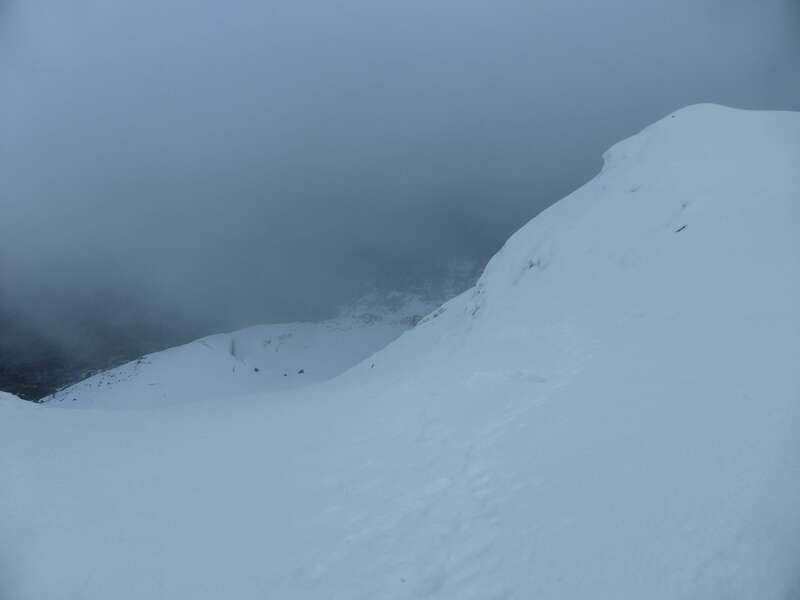 The normal route follows a direct series of snow ramps, the lowest of which we immediately began climbing. The snow was in superb condition; not in the slightest bit icy, but firm, crisp, and supportive. The lower quarter of the glacier was moderately sloped, but quickly became steep as we ascended. As we climbed the cloud cover began to clear in patches, giving us a better look at the route ahead and the terrain around us. After some twenty minutes of cramponing the snow became steep enough to place our first picket. I climbed the next three pitches on Pato’s belay, a series of ramps taking us across a pair of well covered and easily avoided crevasses. 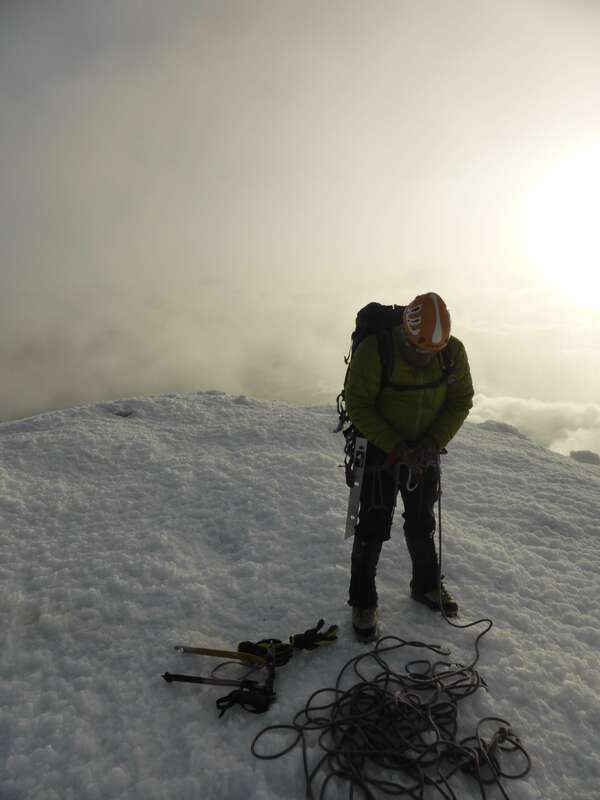 The snow quality made climbing feel secure on the steep ramps, which were never less than 45 degrees and around 65 degrees at their sharpest. An unprotected fall higher up on Illiniza Sur would be a frightening prospect, with no terrain features to prevent a slide all the way to the glacier’s base. Despite trying to pace carefully, the altitude and steep grade combined made the climbing feel very tiring. Looking down the steep ramps. With the angle tapering off slightly near the top, Pato and I simultaneously climbed the final two pitches to the summit. Curving left around a rock outcropping, we continued to rely on snow pickets for fall protection. 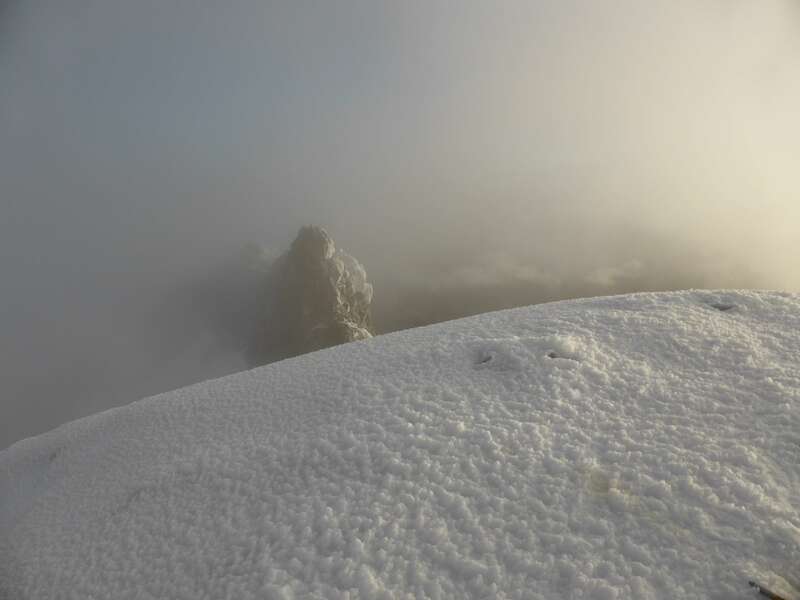 We reached the summit at 6:30 a.m., two and a half hours after leaving the refuge. Looking back up the final, less sharply angled pitches near the summit. 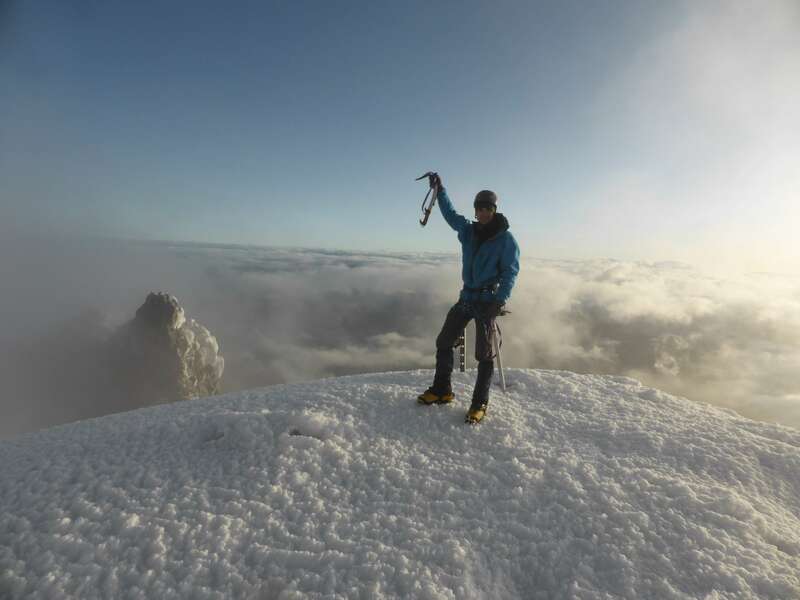 The summit of Illiniza Sur. Happy to be at the top, we took a break to rest and rehydrate. 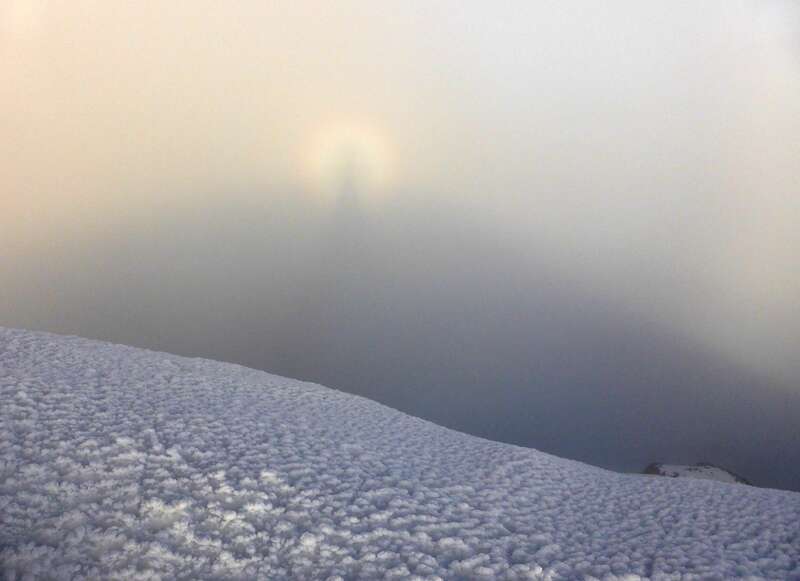 As the sun rose behind us, a beautiful ‘Buddha’s Halo’ rainbow circled our shadows in the clouds. Buddha’s Halo in the clouds. Pato on the summit of Illiniza Sur. On the summit of Illiniza Sur. After a good fifteen minute break, and no sign of the clouds clearing to give us any real views, we began to descend. With such fantastic snow conditions we didn’t need to face into the mountain and downclimb, allowing us to make good time. Crossing the second crevasse. 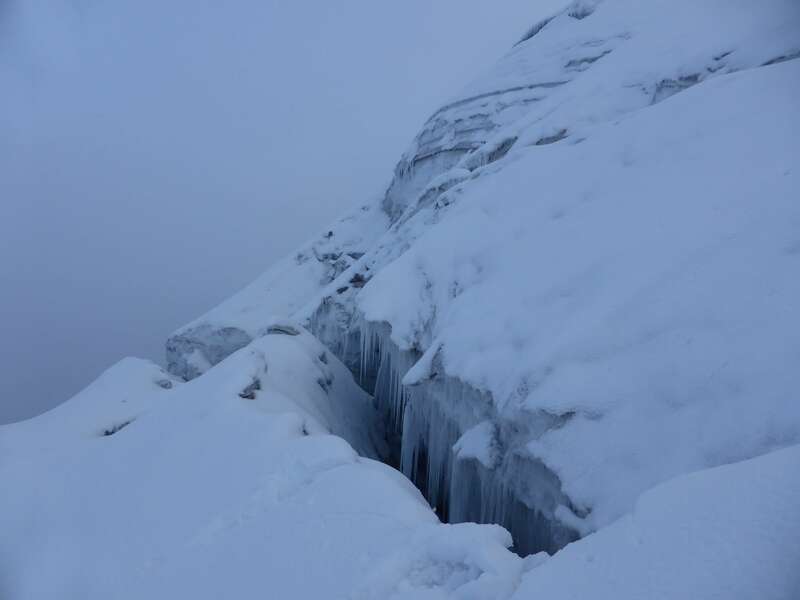 The two crevasses on route were well filled in with snow. 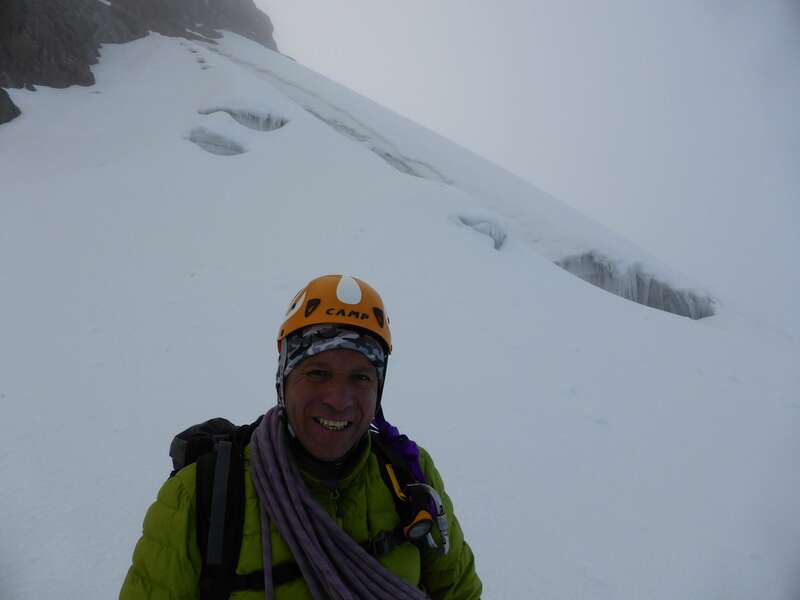 My climbing partner and mountain guide Pato. As clouds blew past us, Illiniza Norte occasionally appeared across the saddle. Illiniza Norte across the saddle. Occasional views through the clouds. The first, and largest, of the crevasses on the glacier. When we reached the rock gully I rappelled down off of an old piece of thick webbing tied around a boulder, avoiding the slippery rock. Aside from this the descent was fast and clean on such firm snow, with no need to rappel even the steepest of the pitches on the glacier. The hike across the saddle went quickly, and we made it back to the refuge at 8:00 a.m. We quickly ate a hot breakfast in the cabin before packing up our equipment and hiking down the trail to the parking lot. While a short climb, Illiniza Sur felt challenging and rewarding, with steep snow at altitude posing a good physical test. The climb was very easy to access due to the mountain cabin, and my three days spent on the Illinizas served as superb acclimatization preparation for climbing more of Ecuador’s higher altitude volcanos. Illiniza Sur is very accessible, but does involve steep glacier travel requiring prior experience with technical equipment and technique. A more thorough explanation of the route, with diagrams, can be found on Summitpost: http://www.summitpost.org/illiniza-sur-iliniza-sur/151054. This entry was posted in Ecuador, Mountaineering and tagged Buddha's Halo, Ecuador, Iliniza Norte, Iliniza Sur, Illiniza Norte, Illiniza Sur, Machachi by Ian. Bookmark the permalink.